NORAD fighter jets escorted two flights to Atlanta airport after authorities received bomb threats via Twitter they deemed “credible”. Bomb squads swept the planes, which landed safely. Passengers were evacuated and questioned. Hartsfield Jackson International Airport in Atlanta, Georgia, was partly shut down Saturday after Delta flight 1156 and Southwest flight 2492 landed there safely, and bomb squads with canine units were sent to search the planes for explosives. NORAD Media Relations Specialist, Preston Schlachter, confirmed to local NBC-affiliated channel WXIA-TV that two F-16 jets had been launched from the McIntire Air Force Base in South Carolina as a “precautionary measure” and escorted the planes. Following evacuation, the passengers were all asked for a copy of their IDs, while some of them were interviewed. TSA also reportedly did random explosives tests on travelers’ hands. An airport spokesman was quoted as saying “we believe the threats to be credible.” It was later revealed that the threats in question were made via Twitter. This has not been officially confirmed by airport staff or police. @DeltaAssist I have a bomb on one of your planes, but I forgot which one when I left the airport. Can you help me find it? The same user threatened that a bomb “will be detonated at a random time of my choosing” on Southwest Airlines flight 2492. 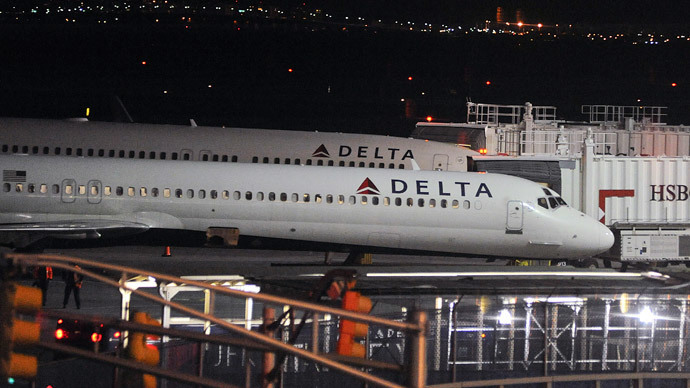 “Zortic” even elaborated on how the bomb was allegedly smuggled through airport security onto the Delta flight, and where it was placed in the plane. “Everyone will know when it’s detonated,” he claimed. The airport later confirmed that both planes had been cleared and all operations had been resumed, with no explosives apparently found. It also said that Atlanta Police and the FBI were investigating the threats. All clear for both aircraft & normal airport operations have resumed. Thank you for your patience. Safety & security are our top priorities.